But making up for the lack of emotional complexity in this film is its excellent animation and the thrilling racing sequences. As a spoof of James Bond films, there is some clever humor and the nifty use of gadgets and gizmos. The film addresses such basic themes as friendship and loyalty, and also glosses over a not-so-subtle pro-environmental message. 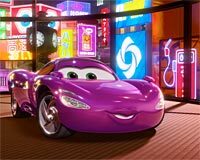 Cars 2 may have less heart than Pixar’s earlier gems, but as an animated adventure it’s not bad at all. They’ve set the bar so high, anything short of excellent feels like a disappointment.I’m going with three out of five for Cars 2, directed by John Lasseter. There’s no shortage of fun and thrills, but it’s missing a hero to root for. The highpoint of the film are the picturesque locales where McQueen tests his skills on the race track. London, Paris, Tokyo and the exotic countryside of Italy almost dazzle you with Pixar’s impeccable animation creating art on screen. The film does get a bit complicated with too much of the espionage plot and the fuel controversy and the focus tends to shift from the races which are the essence of the film. But by and large, Cars 2 is fun for the family and great fun for kids. A confession: Part one was better. Cars 2 is more than just quality animation, and it’s more than just a film. It’s the dream of every pre-pubescent male who spends hours in his room, constructing stories with and breathing life into his toy cars. Backed by the visual splendor that is taken for granted when it comes to a Pixar feature, the characters, their actions, their locations and their dialogues prove to be as endearing to grown-ups as they are to children.For the most part, Cars 2 promises to entertain both, children, with an appetite for clean humour as well as adults who revel in the innocent juvenility of a children’s films.